We can't stay out of the spotlight! Maria and company have been garnering quite a bit of media attention. Our shop was used as the setting for a national Bank of Montreal commercial in March 2005. We also do regular radio ads, print interviews and TV apperances. 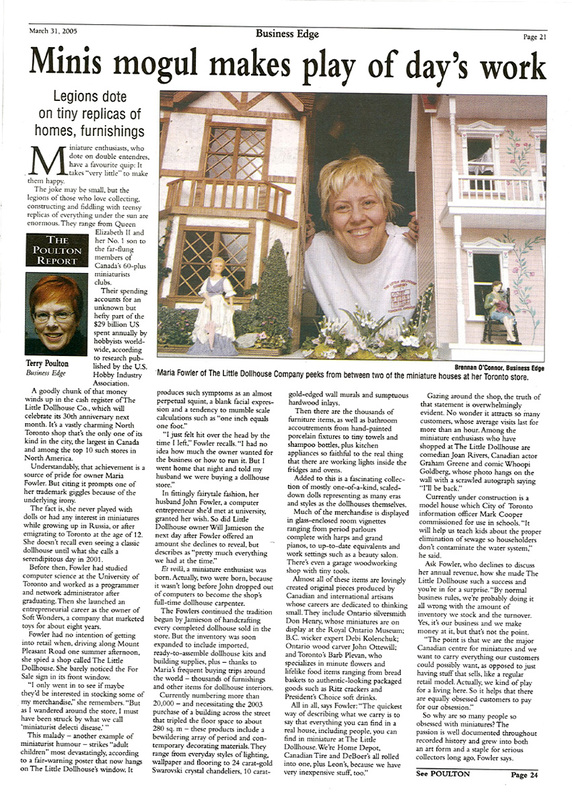 Use the links below to read articles about The Little Dollhouse Company. Does your dream house include a wee wraparound porch and cedar siding? Or do you fancy a Victorian beauty with a bedroom balcony big enough to hold a mouse instead? 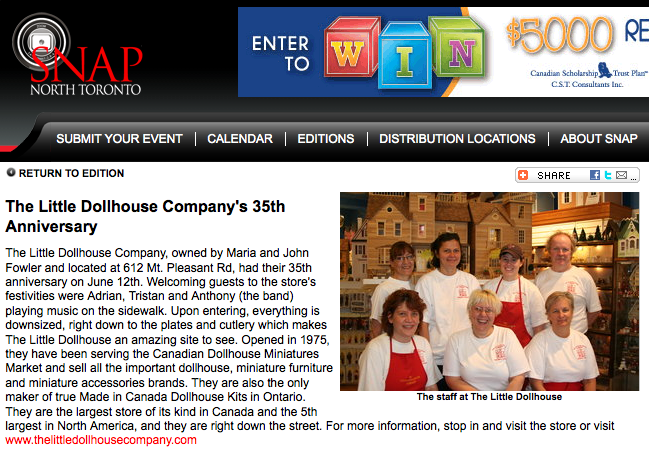 Then head over to the Little Dollhouse Company on Mt. Pleasant Rd. and peek into one of the tiny windows for a glimpse at yesteryear and the way we lived - and how some of us would like to live today. It's the only store in Canada to manufacture dollhouses right on the premises, says owner Maria Fowler who, along with her husband John, gets to play house everyday. Fowler is on a first-name basis with many of her customers and the atmosphere is more club-like than retail outlet. 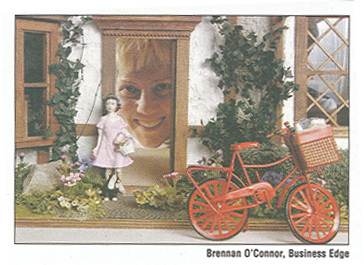 Customers can buy ready-to-assemble dollhouse kits or order a custom-designed one. They can attend workshops to learn the tricks of the miniature trade and purchase any decor item needed to make their house a home. "It's a giant creative process," says Fowler, and appeals to both hobbyists and miniaturists. "Men enjoy building the structures while women like to work on the interiors." "We're committed to stocking really neat stuff - much like a dollar store and The Art Shoppe combined," laughs Fowler. No detail is overlooked by the artisans who make their living by thinking small. A sterling silver tea set reproduced from a client's photo sits proudly by the cash register, while a repro Tudor bed with turned bedposts, stained glass back panel and velvet bedspread resides in a locked display case. Did I mention the Tudor bed retails for $1,000? But you don't have to be a millionaire to play this game. 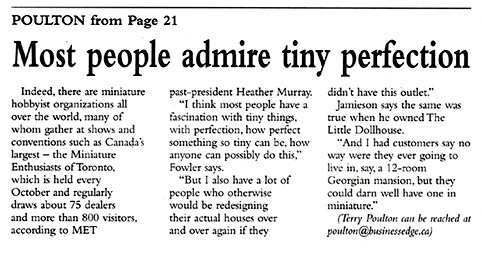 One uptown client remarked to Fowler that he enjoyed his wife's new hobby because she now left the house alone and worked on the dollhouse instead. The dollhouses and contents mimic the minutiae of our everyday lives without having to invest the big bucks. Hobbyists outfit their diminutive dwellings with barking dogs and working lights. They stock their pantry with tins of Heinz beans and baskets of cabbages. They embellish their compact quarters with pressed tin on the ceilings, install handpainted porcelain fixtures in the bathroom and illuminate the dining room with a 24-carat gold Swarovski crystal chandelier. So step back in time and see how we used to live, how our kitchens, parlours and bedrooms used to look. 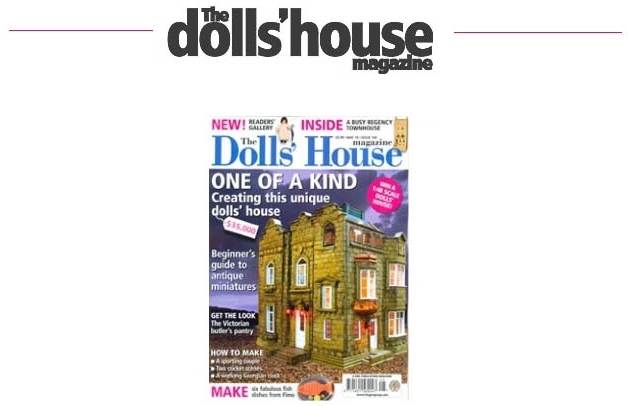 Who knows ... you may discover your inner child and want a dollhouse of your very own.